Email marketing is an important option for both entrepreneur Blogger and Internet marketers. For email marketing's essential tools is email sending services. Awber, Mailchimp, Madmimi, Get response are very popular. In these email sending services Mailchimp is very good choice for no matter you are beginner or pro and of course it's free and have ability to send beautiful customized newsletters. 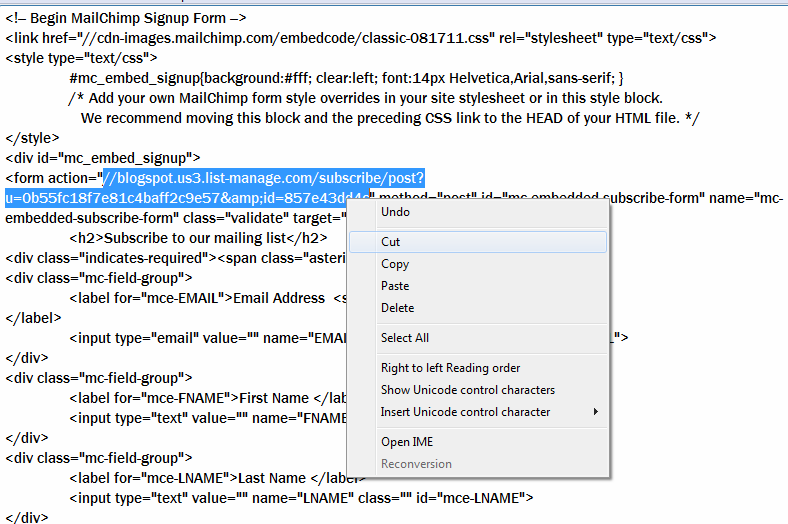 For sending newsletter you will need to have a list what can be done by sign up form. Problem is there Mailchimp Optin/email subscription/newsletter sign up forms are very simple and looks a bit of awkward with our themes/templates, Right? So reveling you from these boring-ness with sign up form here I publishing a homemade professional looking mailchimp sign up/subscription form. It's easy to configure and flat designed and it will easily match with any blogsites/websites. Let's see how it looks like and how to add it to your Blogger blog and wordpress sites and how to configure. Click on dropdown menu, select, 'Sign up forms' from there. And select the following link what shown as image and replace the link with my default link (pink colored).